It’s that time of year, folks. Time to start thinking about transitioning to the warm and cozy, the comfort and layers, and anything else that makes you go Ahhhh. For me that feeling starts within my home, its decor. 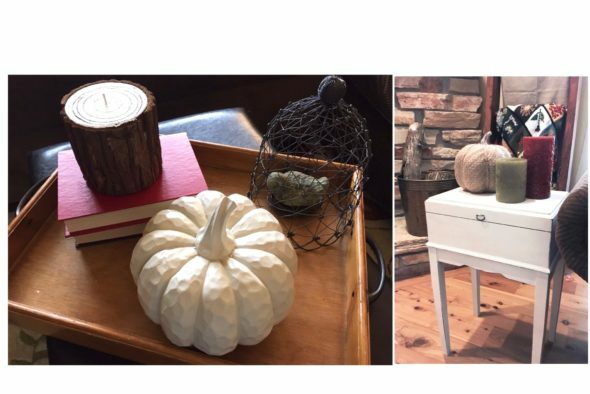 This season I decided to decorate using both thrifted items along with brand new items. At Home Stores provide an opportunity to share my design inspiration and specifically my reason I love to create a “homey” atmosphere. 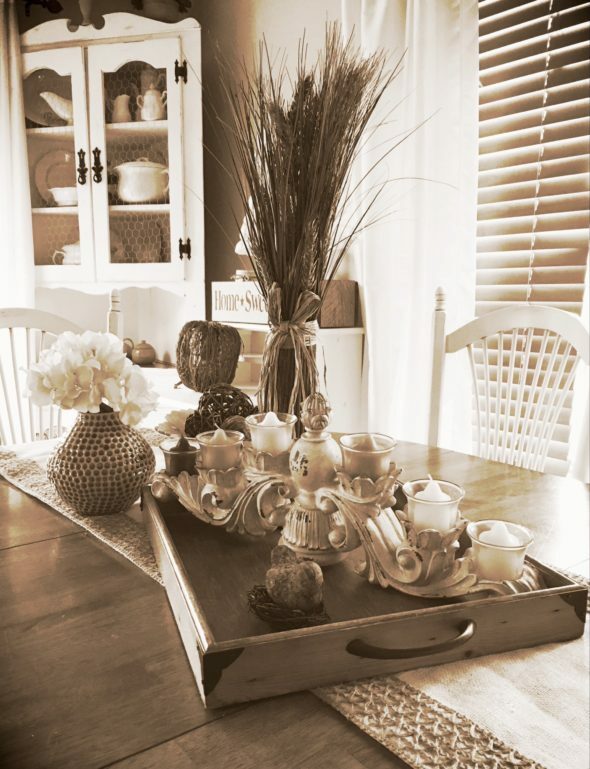 Pour yourself a cup of tea, sit back and enjoy my Thrifty Fall Home Tour. Welcome to my home. 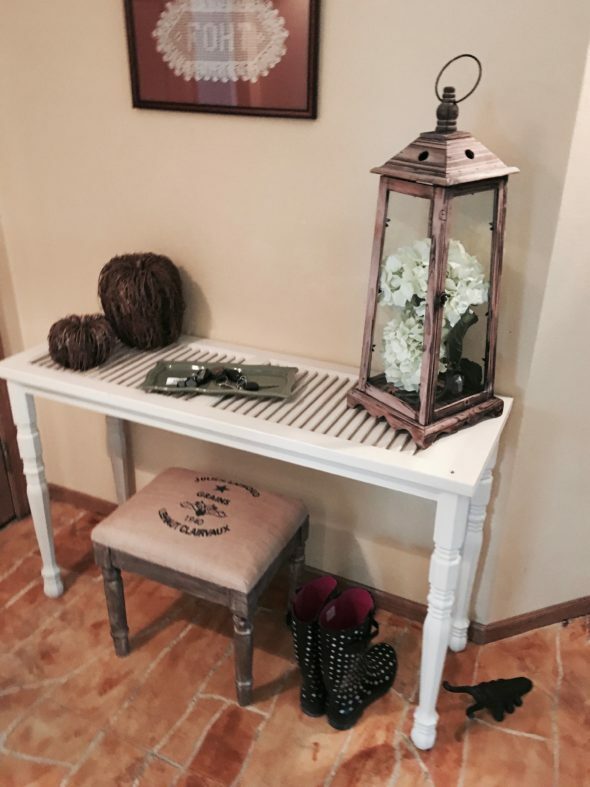 Watch your step as you walk past an upcycled old door and a reclaimed barn board bench. Each I found on different treasure hunting trips. With a little paint and accessorizing, the two blend well together. As you enter, you will notice a blend of old and new decor mixed together. Ask anyone who knows me well. 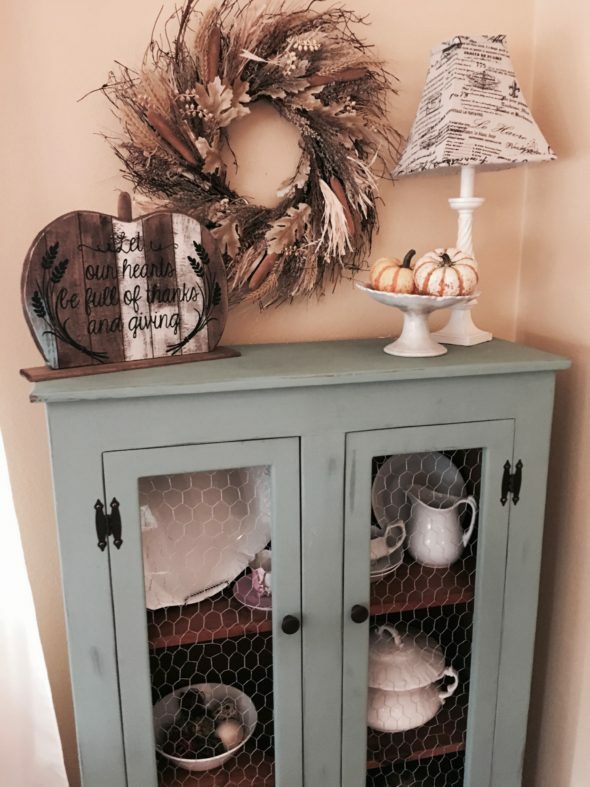 I have only one way of decorating, that is mixing the old with the new, the thrift store find with the new current trending item. If you love it, it will all flow together. Trust me. I do it all the time. 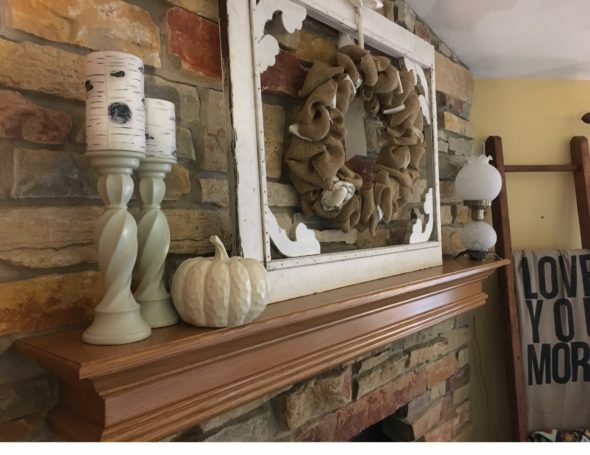 As you look around, my foyer, great room and dining room, take note of how these items are combined to create my Thrifty Fall Home Tour. Walking though the foyer, you will enter the family room. It’s a wide open space that is very much lived in on a daily basis. Throughout this decorating process, I mainly stayed within the neutral palate. However, during my At Home Shopping Spree, I came across a great rug with awesome color and print. I just had to have it. 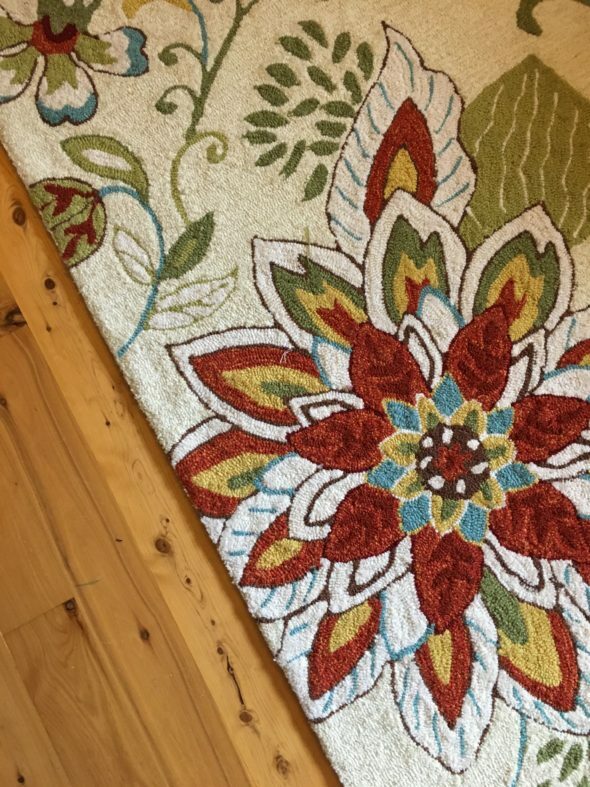 Here is an up close look at the area rug I fell in love with. It’s vibrant, thick and polyester, allowing great wear in this high traffic room. The best part, it was on sale when I found it. It had to come home with me! Thanks At Home! My favorite part of this room is the fireplace. It makes such a great focal point. This is a space I will change out often. Here, you can see how I mixed a thrifty found vintage window frame with some current decor. Because, I was attracted to the curves of the frame, I knew I could blend in easily with my fall decor. If you love it, it will work! Again you can see I have mixed the old with the new. I love old doors and you can find them throughout my home. Making the home more cozy, requires pillows, lots of pillows. At Home Stores have an abundance of choices. I chose a couple of cream colored ones to stay within the neutral pallet , but added a pop of yellow too. It’s fall after all. Beyond the family room is the dining area. Actually, it’s one large space, but the sectional helps as a room divider. Because it flows into the other, I wanted to continue with the neutral pallet. At Home Store had some wonderful fall home decor to choose from. 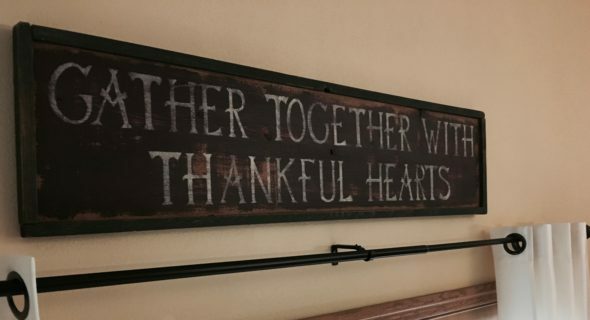 The fall wreath and thankful pumpkin sign were perfect for the dining area. The vintage inspired candelabra was the perfect height to sit upon the table, and the white terrarium on the buffet made the green apples inside just pop. Those colors drawn from that great area rug. Well there you have it, folks. I hope you enjoyed today’s Fall Thrifty Decorating Tour as much as I did. 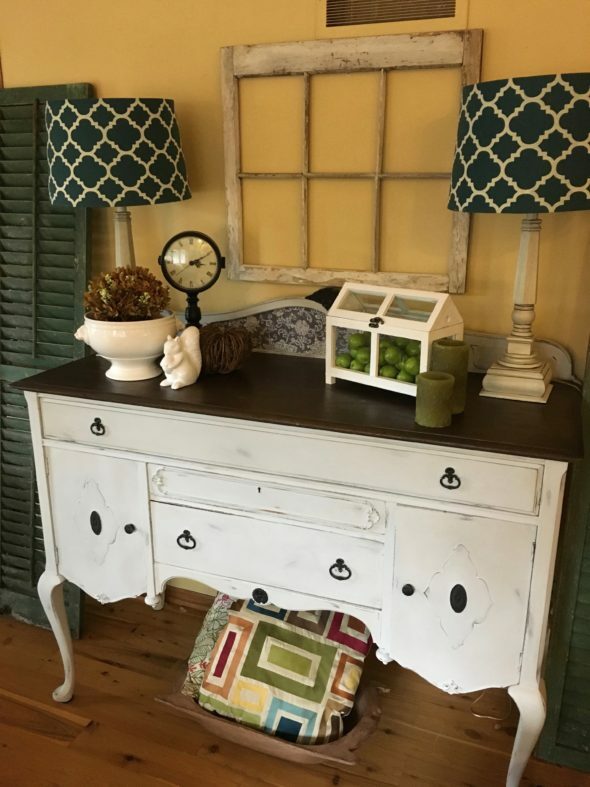 I had a blast being able to decorate on a budget by mixing thrifty treasures with my new At Home Finds from At Home Stores . If you would like to continue on with more fall tours, please stop by the following blogs. They too will be sharing their reason to decorate for fall. I love how you mixed old and new together. It makes your home feel comfortable and lived in. I loved the buffet in your dining room with the lamps and terrarium. What a lovely home you have Mary. Everything fits together perfectly and it is all so warm and cozy. I love your rug with its vibrant colors. And as you say, if you love it, it will work. You are some serious goals! WOW!!!!! Your house looks A MAZING! Thanks Liz. It was a fun project. Totally love your reading nook, I love the rusty look and I love the Spaciousness your home has. Thanks for sharing with us at the Pit Stop! 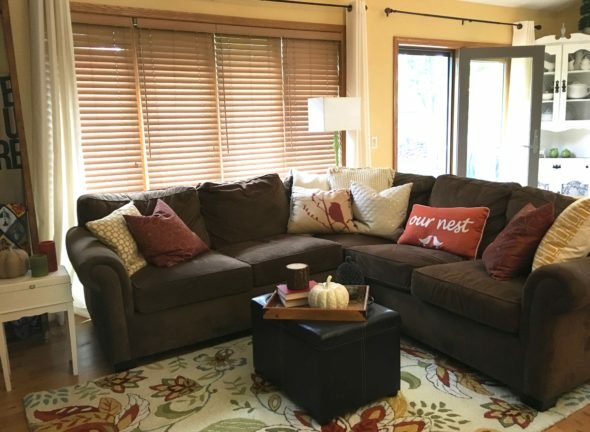 I really like the look of your family room, that looks nice and cozy 🙂 great job! Thanks for the tour. Happy Fall! Wow, it all turned out so beautifully Mary. I have not seen a full your of your home like this. 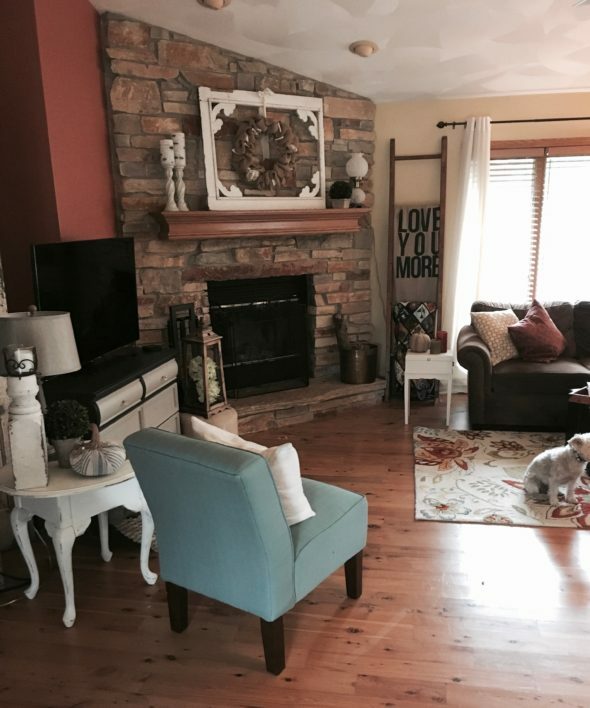 I love how you kept the neutral pallet throught with a pop of color drawn from that beautiful rug. And I love your decor style. Very nice! Mary, you have such a talent for decor. I love your style too. 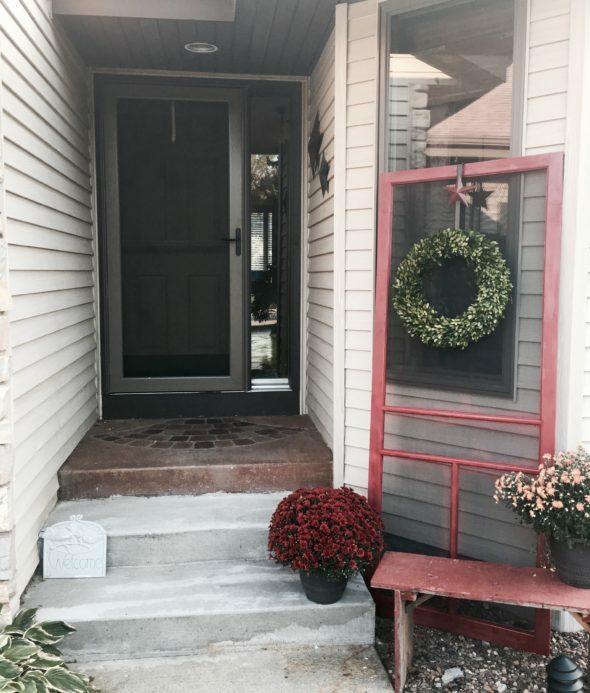 Your entry is so fun with that old screen door, I want one! The mantle is my favorite in the den too and you found the perfect rug for the room! Everything feels warm and welcoming. It all turned out so beautifully! I love that rug! And you are so right about the pillows – I don’t think their selection can be beat by anyone! 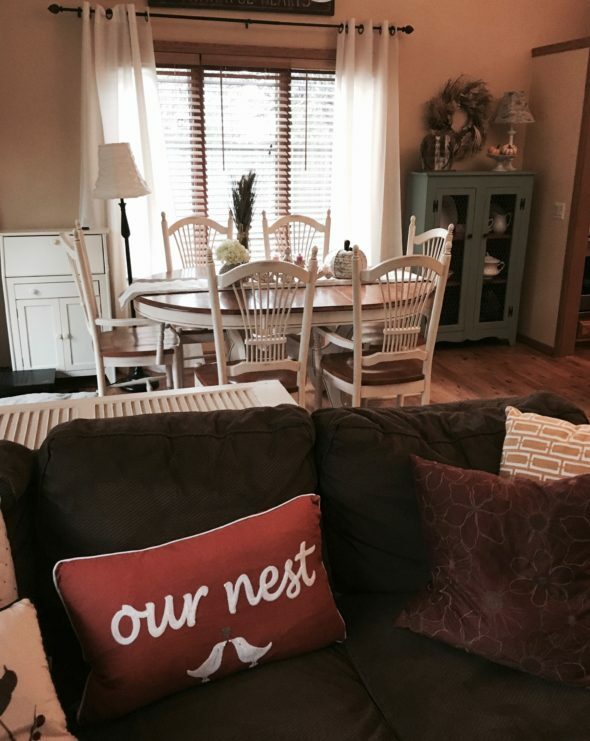 Kristen from The Road to Domestication recently posted…It’s Time for Fall…Inside our Home! 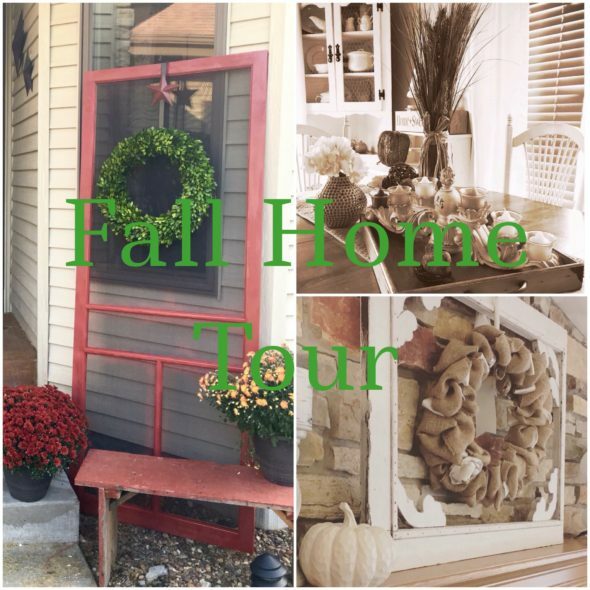 Such a lovely fall home tour! My favorite is your mantle! Your couch looks so comfy with all those cute pillows. And, i love how you use old doors to decorate your home, so fun! Looks great! My favorite is definitely the rug. I love the color palette and how well it works with your home. I love your new rug from At Home. The colors are gorgeous! Your home looks so inviting – from the entryway to the dining room to the great room – it looks like a wonderful place to hang out and enjoy a cup of coffee and conversation. So pretty! Thank you Alli, this whole experience was so much fun! Hi! Welcome to Thrifty to Nifty. Hope you like garage sales, thrift store shopping, and finding treasures at flea markets as much as I do. 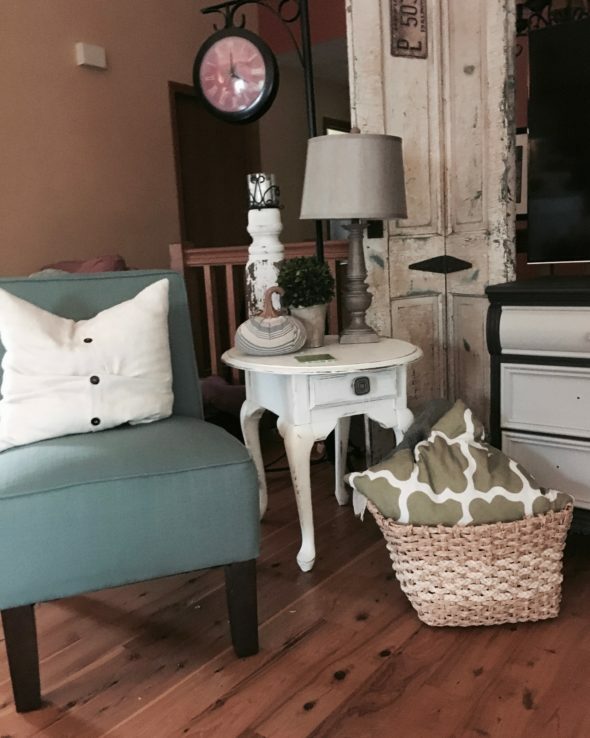 I hope I can inspire you to use your finds to decorate your home on a budget. Please poke around and enjoy.